High Wycombe, May 2013 – Instron’s new AutoX 750 Automatic Contacting Extensometer supports faster, more reliable and more precise material testing. 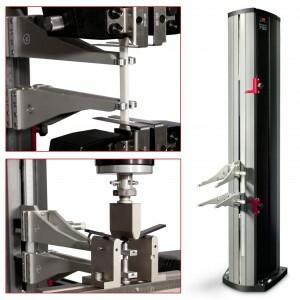 Its high accuracy of + / -1 micron, along with a maximum travel of 750 mm and multiple knife-edge options to make it perfect extensometer for tensile, flexure and compression testing of various materials including highly rigid composites, metals, and plastics. With features including automatic gauge length positioning and automatic attachment to the test specimen with adjustable contact force, the AutoX 750 can Enhance the productivity of testing laboratories. By removing tedious and time-consuming manual steps, lab operators can enjoy a simplified testing routine while Improving throughput. Reducing inconsistencies in how a traditional clip-on extensometer is attached greatly Improves the repeatability and reproducibility of critical test results. Thanks to its high accuracy the AutoX 750 strain measurement meets the specifications of ASTM E83, ISO 9513, and ISO 527-1 (2011). It is fully compatible with closed loop strain control and Complies with ISO 6892-1 Method A and ASTM E8. Instron’s Bluehill ® 3 software package is used to record and store the data Supplied by the extensometer and deterministic mine a variety of calculations including modulus, offset yield, and plastic (non-proportional) elongation to failure. The AutoX can be used with both fully-automated or manual testing system, Instron’s: such as 3300, 5500, and 5900 dual column electromechanical system, and LX, DX, HDX, and KPX static hydraulic testing system. Patent-pending features of the AutoX include: the simultaneous opening and closing of both arms via a common rotating bar with just one engine, making the arms lighter, a debris shield to protect the extensometer from damage due to the ingress of dirt / debris; and to ergonomic tensioner to adjust the gripping force of the measurement arm. Thanks to its robust construction the AutoX can stay attached to the specimen through failure. When not in use, the mounting Allows operators to Quickly and safely position the extensometer out of the test area providing a safe environment for the storage device. Removing the AutoX from the testarea Allows operators to Easily switch out grips and fixtures without the additional step of uninstalling the device. The modulus values ​​of typical composite materials are high and low strain to failure. Malthus the measurement of strain in tensile testing composites (eg AITM 1-0007, ASTM D3039, EN 2597, ISO 527-4/5) requires high accuracy. The AutoX 750 extensometer is capable of meeting challenging requirements synthesis, as shown in A Particular case, where 250 kN Precision Wedge Grips were used on an Instron ® 5900 Series frame. Instron’s Bluehill ® software which used for data recording. Utilizing the automatic nature of the extensometer allowed the user to increase enlarge throughput while Maintaining a high level of repeatability and accuracy Throughout the duration of each test. Using automatic extensometry for tensile testing of composite specimens tow Accor ding to ASTM D4018 Provided precise results in spite of Their irregular cross section and delicate nature. The tests were Conducted using a 5900 Series electromechanical frame, alongwith pneumatic side-action grips. The AutoX 750 automatic extensometer Provided accurate data with improved productivity and reduced operator influence. ASTM D695 is a deterministic Commonly used method to mine the properties of composites, including modulus, compressive strength and maximum compressive strain. A proven setup is the combination of a 5900 Series testing machine, two 50 mm diameter hardened-steel compression platens, a D695 compression fixture, and at AutoX 750 attached directly to the specimen to measure strain all the way to failure. Instron ( www.instron.com ) is a globally leading manufacturer of test equipment for the material and structural testing markets. A global company providing single-source convenience, Instron manufactures and services products used to test the mechanical properties and performance of various materials, components and structures in a wide array of environments. Instron systems evaluate materials ranging from the most fragile filament to advanced high-strength alloys. With the combined experience of Ceast in designing plastic testing system, Instron materials testing Enhances offerings, providing customers with comprehensive solutions for all Their research, quality and service-life testing requirements. Additionally, Instron offers a broad range of service capabilities, including assistance with laboratory management, calibration expertise and customer training.Instron is part of the Test and Measurement division of the U.S. based Illinois Tool Works (ITW) group of companies with more than 850 business units distributed in 52 countries worldwide and a staff of approx. 60,000.